At our dental office in Madison, NJ, the Adams Dental team, providing services in orthodontics, understands how important straight teeth are to both children and adults. A straight smile looks beautiful, is easier to clean and enhances your lips and face. The key to successful orthodontics is diagnosing the problem; then it’s just a matter of choosing the appropriate option to solve the problem. 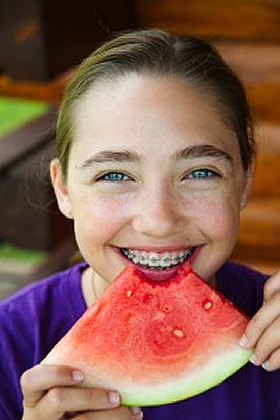 It is never too early or too late to consider orthodontics. The recommendation is that an orthodontic evaluation be done by age seven for children to determine if early orthodontic intervention is needed. But if you are an adult with crooked teeth, you have many options to straighten them that both minimize your visits and maximize the effectiveness. Short-term, limited orthodontic treatment is available in situations where patients prefer to not undergo comprehensive orthodontic treatment but wish to have minor tooth movement to either enhance their smiles or to position a certain tooth prior to the placement of an implant or bridge. Treatment of this nature may be performed with braces or removable appliances. Because Dr. Adams is a Certified Invisalign Premier Provider, a Certified Damon® System Braces Provider and has completed extensive post-graduate courses for general dentists in orthodontics, she is expertly prepared to provide you with solutions that suit your case and your preferences. Find out how Adams Dental in Madison, NJ, can get you the straight teeth you’ve always wanted.